To combat heating challenges in today’s mission critical facility, consideration is often given to using the space above the suspended ceiling as a return air plenum. There are two types of return air plenums: Ducted return air plenums and ceiling return air plenums. 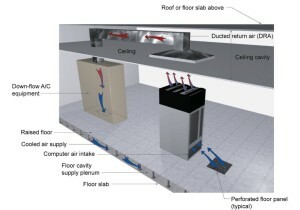 This method requires the installation of ductwork that runs from each computer room air conditioning (CRAC) unit up into the space above the suspended ceiling and to each return air grille. Return air is then directed into the grille and travels to each CRAC unit. This method does not use the entire space between the suspended ceiling and the floor slab above as the return air plenum. Only the ductwork acts as a plenum. This method requires the installation of return air grilles throughout the suspended ceiling and return air intakes at each CRAC unit. The return air is then directed into the plenum through the grilles and travels to the nearest CRAC unit intake. This method uses the entire space that is between the suspended ceiling and the deck as the return air plenum. Regardless of which type of plenum is installed, you should consider modifying your mission critical facility’s existing sprinkler system and/or gaseous suppression system. If a mission critical facility is protected by a sprinkler system, modifications are not necessary if using a ducted return air plenum. Your local Authority Having Jurisdiction – Fire Marshal (AHJ) will determine how the code is applied in your municipality. In some instances, the AHJ may require that additional sprinklers be added to the plenum space. If a mission critical facility is protected by a gaseous suppression system, modifications are mandatory in both ducted plenums and ceiling plenums. Install dampers in the ductwork at the point where air enters from the return air grille and at the point where the ductwork passes through the suspended ceiling. Add clean agent inside the ductwork and include the space as part of the total hazard volume. If a facility is protected by a gaseous suppression system and a ceiling return air plenum is installed, suppression must be added to the plenum space and the space must be included as part of the total hazard volume. In addition, Bick Group recommends that duct detectors be installed at each CRAC unit intake to provide additional protection. If a mission critical facility is protected by both a sprinkler system and a gaseous suppression system, it is only necessary to modify the suppression system. The same modifications mentioned in the previous section apply. Installing a ducted or ceiling return air plenum is a powerful tool for controlling the environment of your mission critical facility. But, it is important to remember that in doing so, modifications will be necessary to maintain the level of fire protection that currently exists in your facility.